Virtualizing desktop environments can offer huge advantages for both manageability and cost savings. App-V and UE-V can be leveraged to help you better realize these advantages. 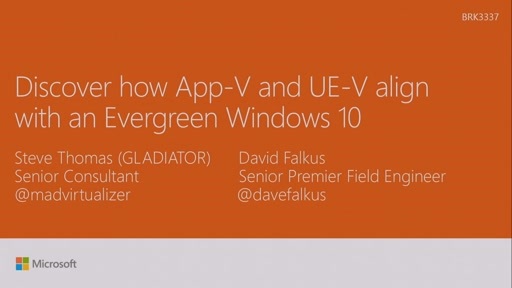 Come join us in this deep-dive session to learn best practices for deploying App-V and UE-V in tandem. We’ll show you how streamlining your App-V package sequencing and UE-V template creation can enable you to greatly simplify your image management practices. We’ll demonstrate how utilizing these two solutions will provide more rapid deployments and increased performance for both physical desktops and VDI. You’ll leave this session understanding how to better empower your end-users productivity and improve their computing experience. 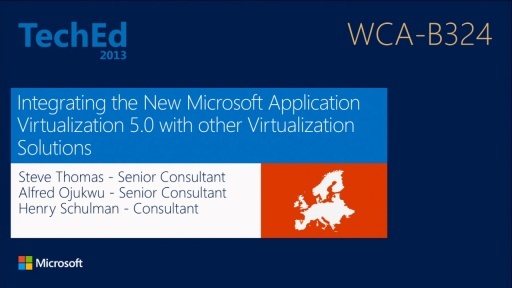 We are in the process of migrating from App-V 4.6 to 5.0 SP3 but after learning that 5.1 has been released, would like to know when it will be available to download and install.